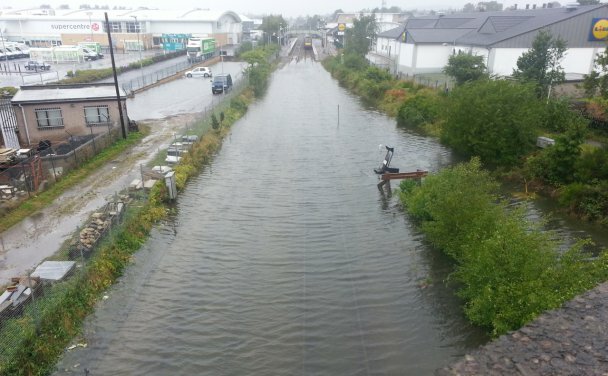 Train services between Inverness and Aberdeen were disrupted given flooding to the track through various stretches in Moray (source: Moray Radio online). On Monday 11th August, the remnants of the ex-tropical storm Bertha brought heavy and very intense rain for many parts of northern Scotland. Early indications are that over 100 mm of rain was recorded over a 12 to 16 hour period (source: Met Office) with some gauges recording between 120 and 140 mm (source: SEPA). The resultant flooding across many parts of Moray and Speyside caused significant transport disruption across the region. The flood forecasting service Heavy Rainfall Alert tool. The map indicates the potential for 40mm in 6 hours with a strong signal (greater than 70%) across areas of Speyside and Wester Ross. The output uses MOGREPS-UK and has a lead time of 29 hours for this 6 hour accumulation at 08:00 on Monday 11th. It was clear from several days ahead that this tropical storm was to make a transition across the Atlantic and head towards Northern Europe, bringing with it the high likelihood of heavy rain and strong winds. Yet, how challenging was it to predict the likely flooding impacts of this weather system over Scotland? The Met Office were providing daily assessments on the likely track of the storm and how this could generate into low pressure systems as it head towards the UK. 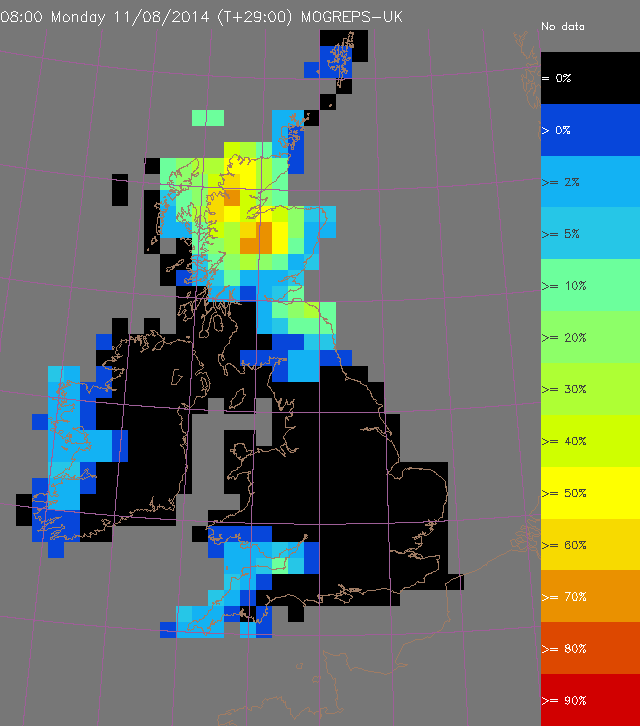 The potential for severe weather affecting the north of Scotland became much clearer during Saturday 9th and Sunday 10th with numerical weather prediction models highlighting an area of significant rainfall accumulation. Potential flooding impacts were highlighted using the Grid-to-Grid (G2G) an operational model run by the flood forecasting service. G2G uses high resolution deterministic rainfall forecasts and forecast ensembles using MOGREPS-UK and MOGREPS-Global. The forecasts from this system were particularly useful in highlighting the rivers and catchments that were most vulnerable to the flood threat which aided early communication and warnings to responders. Output from Grid-to-Grid operated by the flood forecasting service. 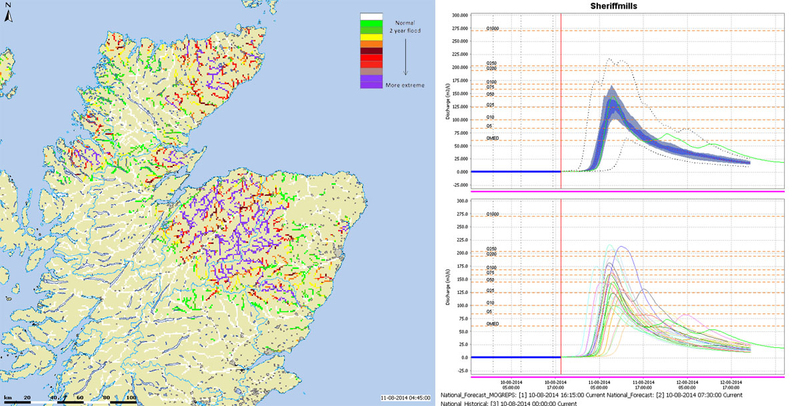 Forecasts for countrywide 1km gridded hydrological response compared with Qt grid to highlight the potential severity of flooding (left) and hydrological ensemble-based forecasts for the River Lossie at Sheriffmills in Moray (right). Flooding of this nature is not unusual for August i.e. 1829 Muckle Spate and 1970 Findhorn flood, however as forecasting science capabilities improve so does our awareness of the potential for significant flooding impacts. The Scottish Flood Forecasting Service was established in 2011 to improve vigilance to flooding as a natural hazard and to ensure the availability of robust and timely advice through the provision of a combined meteorological and hydrological service. Through the activities in the development of new hydrometeorological approaches such as the use of MOGREPS in Grid-to-Grid this has hopefully allowed responders to get the best possible guidance and value from this new capability during the recent floods.